A gang of heavily armed men are said to be raiding mining camps in the Cuyuni area for the past five days , but police do not have the required ground transportation to launch an offensive against the Spanish and Portuguese-speaking criminals. Interior (‘F’) Divisional Police Commander, Senior Superintendent Ravindradat Budhram told Demerara Waves Online News that efforts would be made by policemen to return to the area with the support of either a privately-owned helicopter or another owned by the Guyana Defence Force. Gold miner, Mohamed Sheriff Harry said there are no tractors for miners or police to move around on because the gunmen have hijacked those vehicles and might be heading to other mining camps at Puruni. 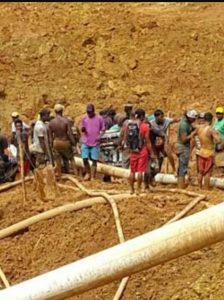 “Police are stranded there because these guys hijacked all the transportation that was there in the backdam so police cannot get in,” he told Demerara Waves Online News. He said the police arrived at Junior Ross Landing by boat but could go no further due to the absence of the tractors. Sheriff said the robbers have carted off security guard weapons, an unknown quantity of gold from his mining camp and “beat workers terribly.” He said six mining camps in the Cuyuni and Kartuni area have been so far robbed by the men who are carrying assault weapons. Budhram declined to say whether the perpetrators are foreign language speakers and if anyone was robbed until statements are received from victims or persons in the area. “So far, I don’t think anybody was injured because that information would come right away because they would have brought them out,” he said. The Divisional Commander confirmed that the Guyana Police Force received a report of the presence of the men in the area last week Saturday. 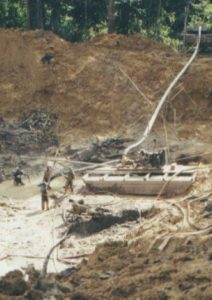 The Divisional Commander said the party of policemen retreated overnight at the Aurora Gold Mines,Cuyuni River because of nightfall and they have since returned and gone further into the backdam.